This book presents a selection of new insights in understanding and mitigating impacts on wildlife and their habitats. Topics such as, species behaviour and responses; collision risk and fatality estimation; landscape features and gradients, are considered. Other chapters in the book cover the results of current research on mitigation; compensation; effectiveness of measures; monitoring and long-term effects; planning and siting. Examples are given of current research on shutdown on demand and curtailment algorithms. By identifying what we have learned so far, and which predominate uncertainties and gaps remain for future research, this book contributes to the most up to date knowledge on research and management options. 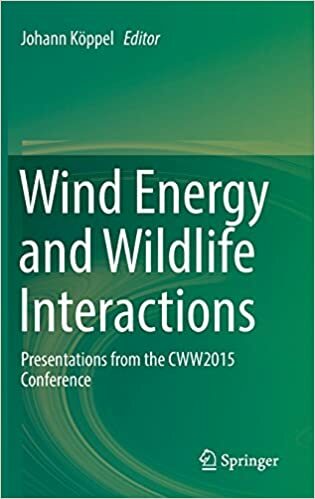 This book includes presentations from the Conference on Wind Energy and Wildlife impacts (CWW15), March 2015, hosted by the Berlin Institute of Technology, which offered a platform to national and international participants to showcase the current state of knowledge in wind energy’s wildlife implications.